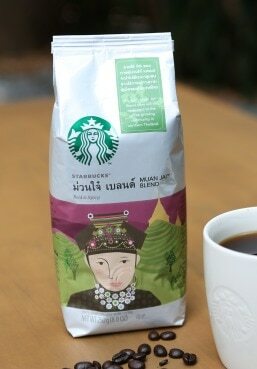 The uniqueness of this first Starbucks Thai coffee blend also comes from its inherent invitation to customers in Thailand to contribute to, and participate in, the welfare of a Thai coffee-growing community. Consumers will not only enjoy a great cup of Muan Jai™ Blend, but will also make a difference with their purchase of this Starbucks® Commitment to OriginsTM coffee. This coffee is now the pride of all the partners (employees) of Starbucks Coffee Thailand. Starbucks Thailand partners are inspired to name this newly created Thai blend "Muan Jai", which means "wholehearted happiness" in the Northern Thai language.